At our displays, folks sometimes study our large wooden table games and do hasty sketches. With this book of plans, we make it easy for you to build all six of the Action Games yourself. The package contains photographs, materials lists, step by step instructions, illustrations, and rules of play â€” all you need to get you going. 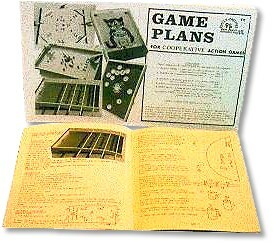 The plans are for the handy person who likes to make wooden games for family and friends, for the teacher looking for interesting woodworking projects, etc. ; but not for commercial purposes. Huff 'n Puff: A little cork ball has to be put in goal with puffs of air. Kelly: A whimsical game about a cat, mouse, birds and a piece of cheese. Flick: The co-operative Crokinole game. Lids: A combination of billiards, caroms and shuffleboard. Pin 'n Ball: A blend of table soccer and pinball with a unique twist. Alley Over: The targets are in the middle at the top of a hill, making for lots of back-and-forth action.